Ancient Stones - Lothian - 024 Buck Stane, Braid Road, Edinburgh. 024 Buck Stane, Braid Road, Edinburgh. 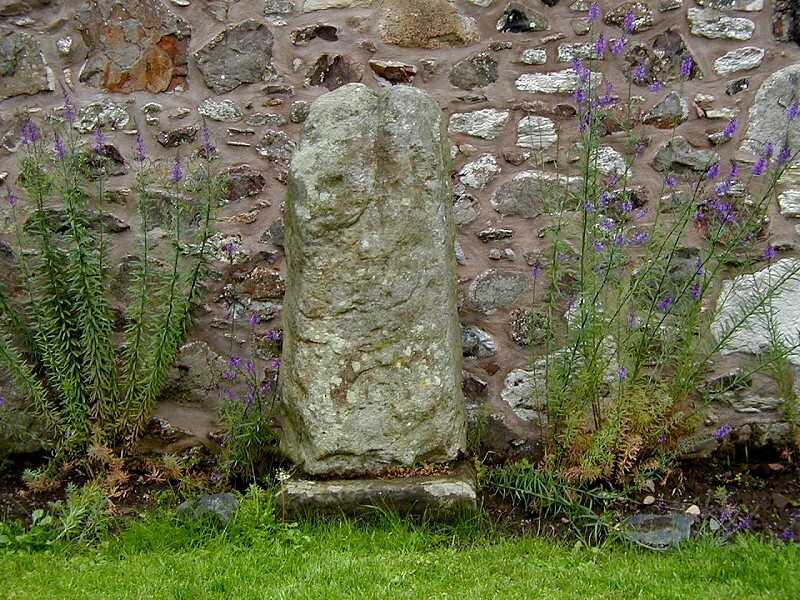 The Buck Stane stands at just over 1.00m high by 0.38m at its widest and is 0.28m thick. It stands against a garden wall in a small alcove beside two garages near the north end of Braid Road. The stone has no distinctive features and an information plaque can be seen on the wall. Braid Road is situated towards the south side of Edinburgh. Leave the Edinburgh by-pass at the Lothianburn Junction and follow the road through the traffic lights at Fairmilehead. At the next traffic lights/pedestrian crossing, turn right onto Braid Road. The Buck Stone can be seen in a small alcove on the right. The use of a street map is highly recommended. There is no charge for parking along most of the streets in the area. 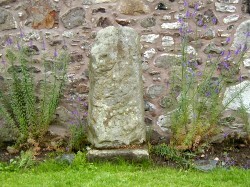 Tradition associates the Buck Stane with the Barony of Penicuik and the royal hunts on the Boroughmuir. A nearby plaque states that the stone marks the spot where the buckhounds were unleashed when the King of Scotland hunted in the region. In certain light conditions the stone does have a phallic appearance. It has also been suggested that astronomical alignments may exist with the Pentland Hills to the south west. I think there's more to the Buck Stone than meets the eye. There is certainly a suggestion of phallic origins about the upper "head" of the stone and it may have been worked in the past as part of the "christianising" process that befell many such fertility symbols. Or perhaps its just a trick of the light? 021 Caiy Stane, Fairmilehead, Edinburgh.